By the time I learned how to make those plaster mouldings my house was overrun with "projects" and the armoire was one of the older pieces, as well as the largest. Sitting front and center where I could see it began to feel more like down my throat. Something had to be done. 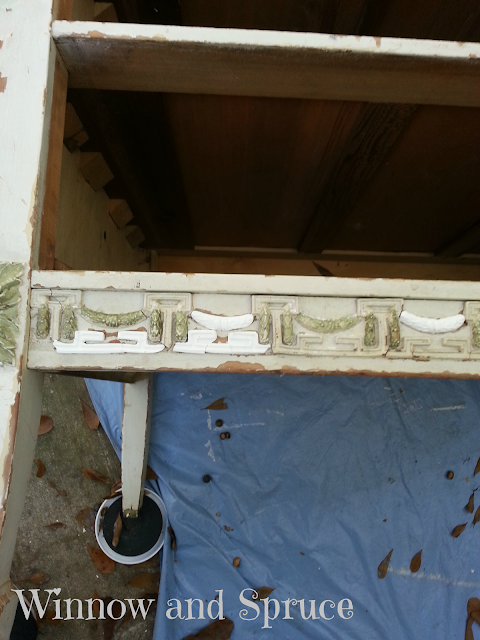 A neighbor helped me start removing the top's veneer which was past saving. That took me two full days to complete. But I knew she had potential. She was extremely well made. And very, very heavy. Since there were some intact appliques I knew I could mold what I needed for replacements. I followed the method I'd used before here, applying baby powder to the existing appliques and making impressions in clay. Plaster of paris was mixed to fill the molds. Once hardened, the clay was pulled away. These pieces were smaller and more detailed. 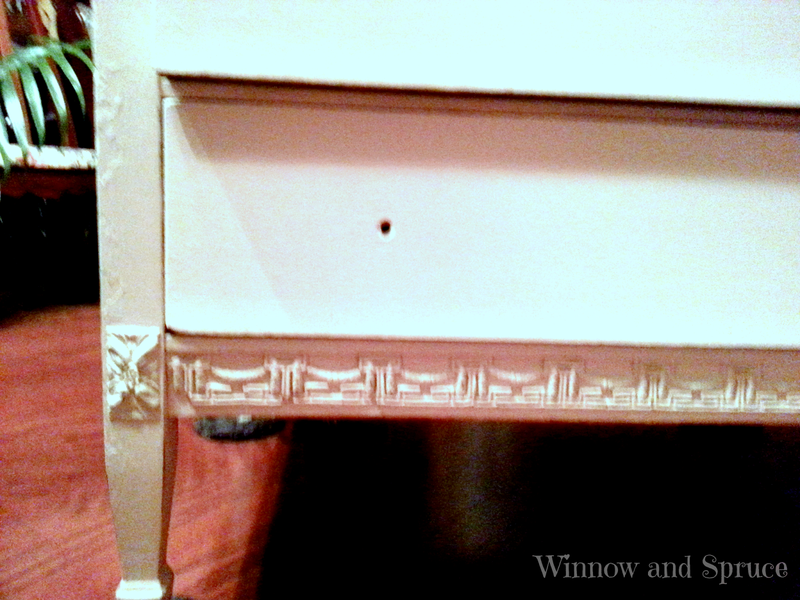 It was slow going to clip, file, trim, and fit them into openings left by missing trim. I glued the plaster pieces into position with E6000 adhesive and allowed them to dry. 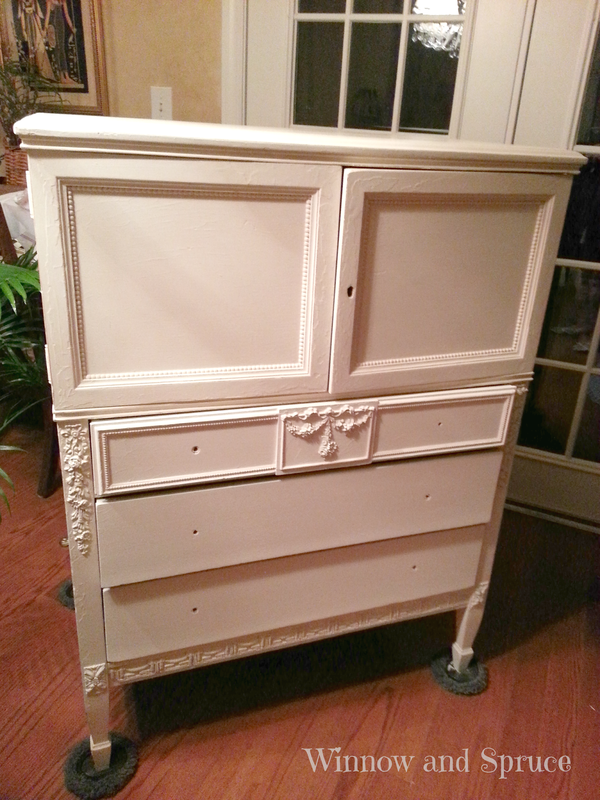 I painted the armoire white, mixing primer, latex and Annie Sloan antique white. 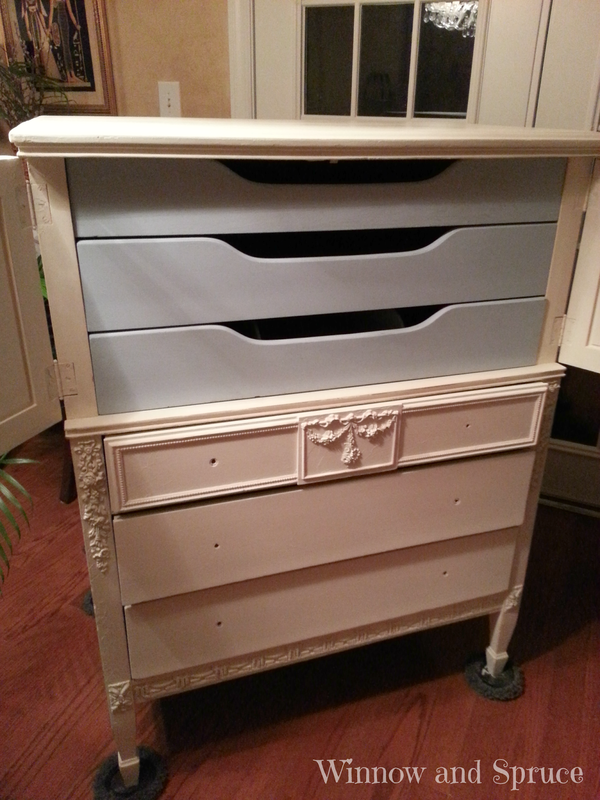 I found new hardware at Hobby Lobby for the bottom drawers and a knob for the chest door. I painted the inside of the drawers, again a mix, but this time including some Annie Sloan Louis Blue, to make everything fresh. 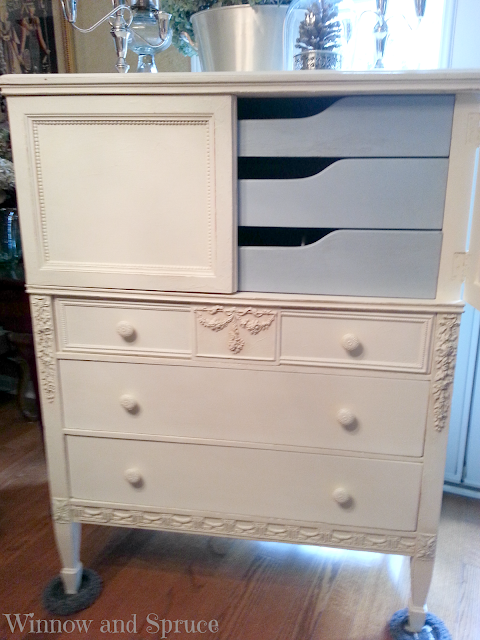 Three coats of furniture wax were applied, allowing each to dry between coats, and rubbed down with steel wool before applying the next coat. A mix of clear and dark wax was applied to just the trim areas. It was done. Fini. Finally. I am pleased with how it turned out but mostly I'm just glad it's done. And I wish I had better pictures. Again, blogging wasn't in the cards back then. So, what's the most important lesson from this project? I learned to be more careful with my purchases. And I learned to be more aware of my time commitment. While most, if not all, pieces can be repaired and given new life they may not be something I am capable of doing or willing to tackle. Knowing that is a good thing. 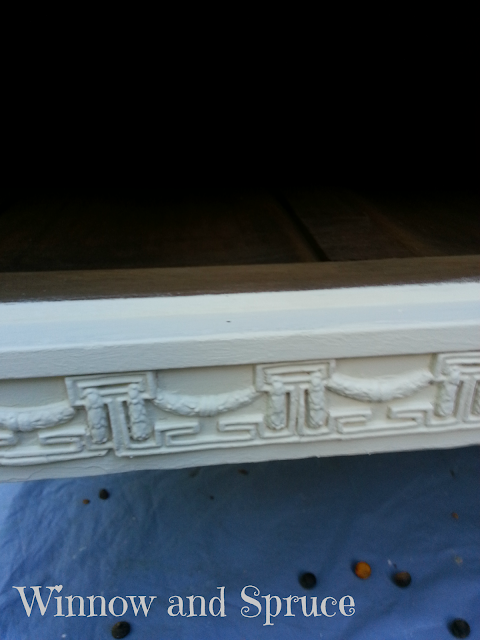 I really enjoy making plaster moulding. And find it strangely relaxing. Who knew? Love this piece. 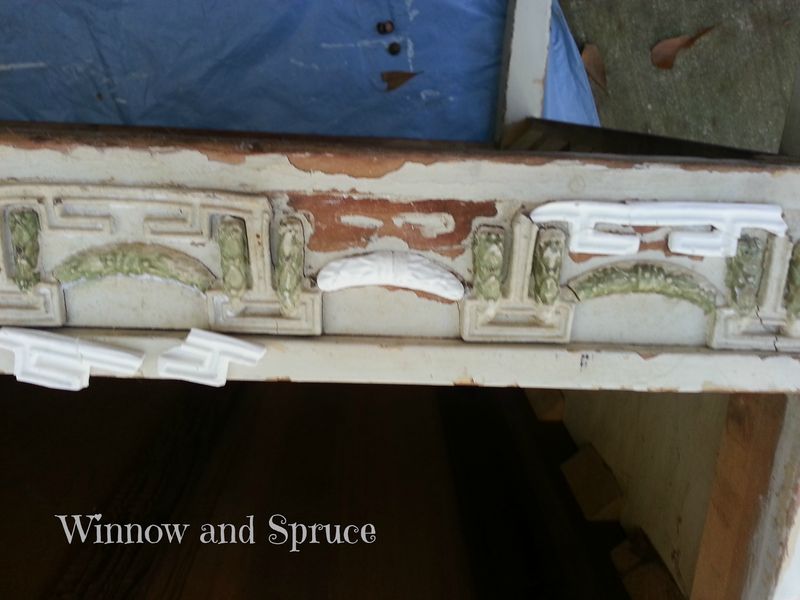 How wonderful that you replaced the mouldings using your own hand made molds. Fabulous! So cute Dianne! Such a tedious project that turned out fabulous. I love how you take old antiques and turn them into something truly new and creative, not to mention beautiful! i love this piece. it's such a beauty, and you've given it such loving care. bravo. stop by when you have a moment for some lovely! Thanks so much, Michele, for your kind words. 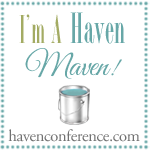 Now that it's done I'm grateful I had the opportunity to *reach* out of my comfort zone. I meant it, though, when I said I'm most grateful that it was finally finished! Your expertise is very valuable. Oh, Debbie, what a lovely thing to say. Really. I'm so glad you stopped by, and hope you will again soon.